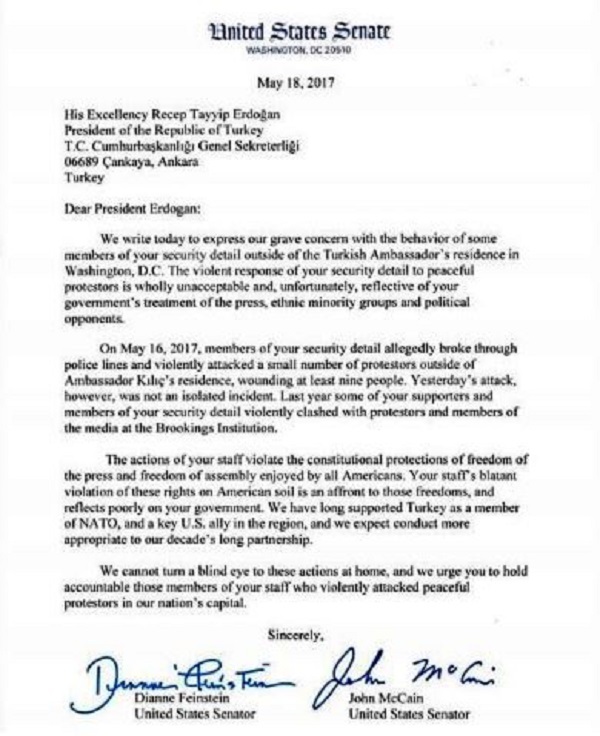 McCain and Feinstein’s statement continued as follow: “On May 16, 2017, members of your security detail allegedly broke through police lines and violently attacked a small number of prostestors outside of Ambassador Kılıç’s residence, wounding at least nine people. Yesterday’s attack, however, was not a isolated incident. Last year some of your supporters and members of your security detail violently clashed with protestors and members of the media at the Brookings Institution. “The actions of your staff violate the constitutional protections of freedom of the press and freedom of assembly enjoyed by all Americans. Your staff’s blatant violation of these rights on American soil is an affront to those freedoms, and reflects poorly on your government. We have long supported Turkey as a member of NATO, and a key US ally in the region, and we expect conduct more appropriate to our decade’s long partnership. Meanwhile, the Voice of America (VOA) published a new video of the brawl between demonstrators and Erdoğan’s security guards during his Washington visit. The video is showing that Erdoğan watching the events from his official car and at one point, surrounded by an army of bodyguards, steps out of his car to inspect fight. Erdoğan appears in the video that he directly giving orders to his security detail closest to him and overseeing the aggression. The first Turkish bodyguard who seems to have taken order from Erdoğan himself, talks to another detail, who immediately runs toward the crowd. A few seconds later, following the lead of the second guard, rest of the guards seem to be launching the brawl with the protesters. Erdoğan then continues to watch as events unfolding few seconds more before moving inside the residency.